Every month, the Public and Media Relations Department focused on a specific topic of interest about the City of Columbia and shared facts, statistics and details that the citizens of Columbia may not be aware of. 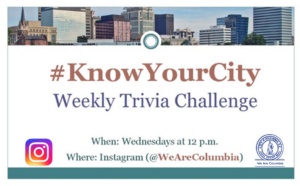 #KnowYourCity is featured on the City’s Instagram page @WeAreColumbia every Wednesday at 12 p.m. The first person that responds with the correct answer wins a prize from the Public and Media Relations Department.